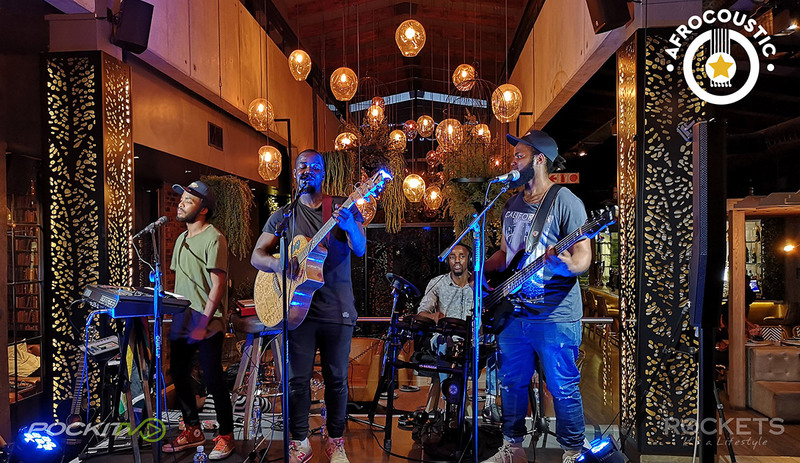 Rockets Restaurant in Bryanston have been hosting the Afrocoustic sessions on a Thursday night, and the live acts have been thrilled to use an Electro-Voice Evolve 50 system as the main PA. The Afrocoustic sessions give a platform to established and up and coming musicians to perform at one of Johannesburg’s top restaurants. The sessions are filmed and broadcast by Pockittv, so lovers of Afro Soul can watch the shows on their mobile devices if they can’t make the live show that night. The Evolve system was perfect for the venue, which has noise restrictions as it’s based in a residential neighbourhood. The linear line array design allows for the perfect levels within the venue, without bothering the neighbours. The built in Bluetooth DSP control allows the venue manager to control sound levels via the EV app throughout the night. To add colour to the shows, Prosound have also provided ETC parcans and lighting controls. The Afrocoustic Sessions take place at Rockets in Bryanston every Thursday nights. Line-ups for the sessions will be announced by Rockets and Pockittv, follow their Facebook pages to get regular updates.